Classic Sloppy Joes in just 20 minutes with a rich homemade tomato gravy, bell peppers and melted cheese on hamburger buns. 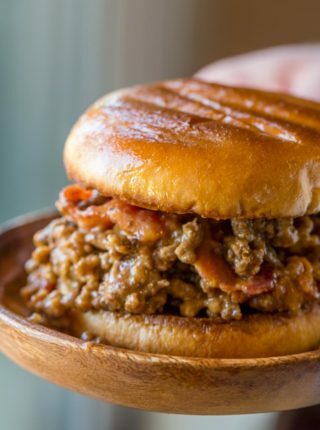 Classic comfort food recipes are favorites on the sites including Slow Cooker Pot Roast, Ultimate Beef Stew and Slow Cooker Chili because they’re family favorites that bring back happy food memories and these sloppy joes are the perfect recipe for your favorite family meals. Ultimate Sloppy Joes made without the Manwich Canned Sauce or the packets of sloppy joe seasoning you may have grown up with. 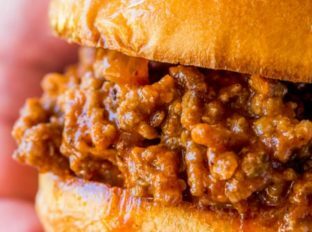 With just a few pantry ingredients you’ll have a whole new appreciation for classic American dinner favorite recipe sloppy joes. 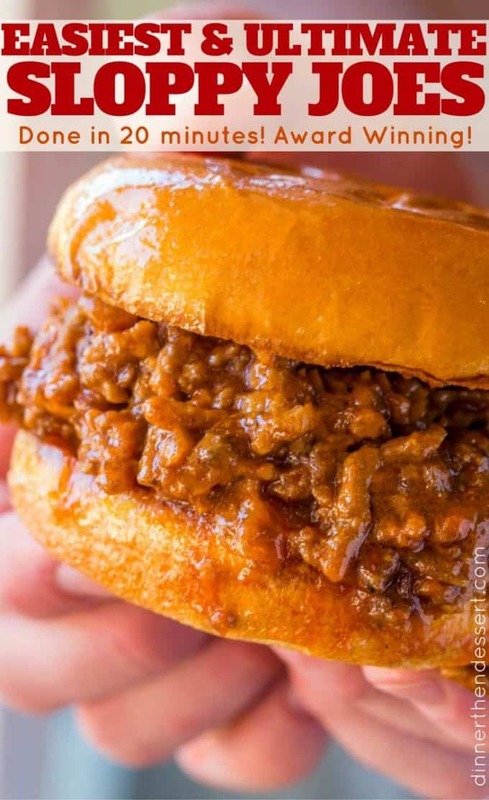 We call these the Ultimate Sloppy Joes, but you may also want to refer to them as Award Winning Sloppy Joes because this recipe has been victorious in three separate sandwich contests including one in college where it beat out over 50 other sloppy joe recipes! Plus it wins the most important contest of all, the kid contest. Kids LOVE this recipe because it is the perfect combination of sweet and savory flavors topped with cheese. In my ten years of working as a chef, I’ve not had a single kid refuse these sloppy joes. Take that as a pinky promise from me to you, as a professional chef, these are the best sloppy joes. They’re so good that the base of this recipe made me want to create 25 more sloppy joe recipes! 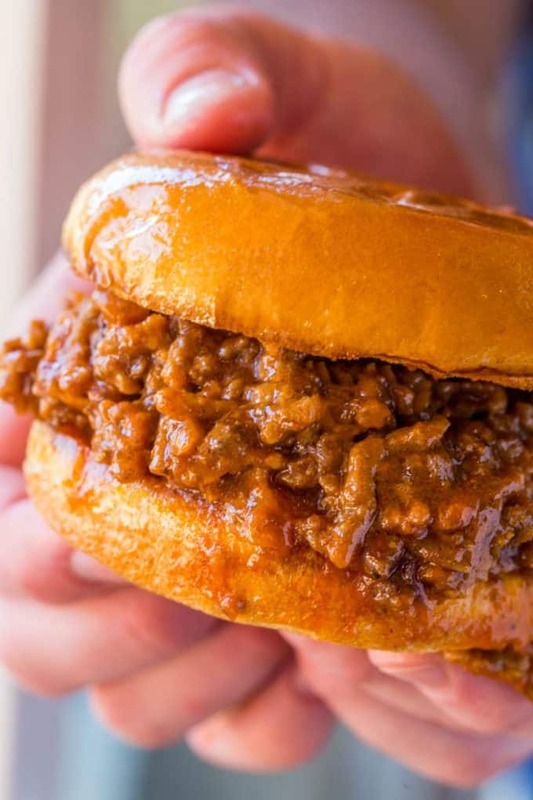 We’ve have others flavors, from Philly Cheese Steak, Bacon Cheeseburger, to Pizza too so if you love these Classic Sloppy Joes you should definitely try out more (my husband’s favorite is the Bacon, Beer and Cheese Sloppy Joes)! I was looking for something quick to make for dinner since I ended up working late. Most of the ingredients I had at home and only had to stop to get some ground beef on my way home. I’ve never been a huge fan of Sloppy Joes but my SO really likes them so I thought “why not”. And boy oh boy am I happy I landed on this recipe. 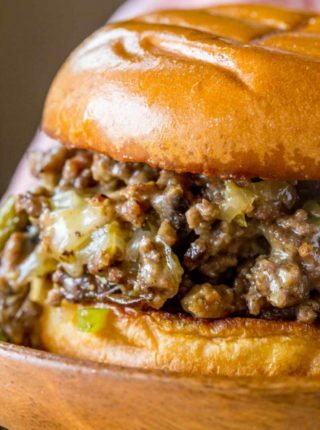 This recipe has permanently changed my mind on what a good sloppy joe is. Thank you so much for sharing this. I can’t wait to make them again! Homemade sloppy joes are made with ground beef, onion and green bell peppers that are simmered in a brown sugar and ketchup gravy until thickened and served on a bun. I’ve looked at the back of the Manwich cans, and I can’t vouch for this recipe to be like a homemade Manwich sloppy joe, but I can say many of the ingredients are similar. This is also not the same as if you grew up eating sloppy joes made with tomato sauce, but the ketchup in the recipe acts in a similar way. 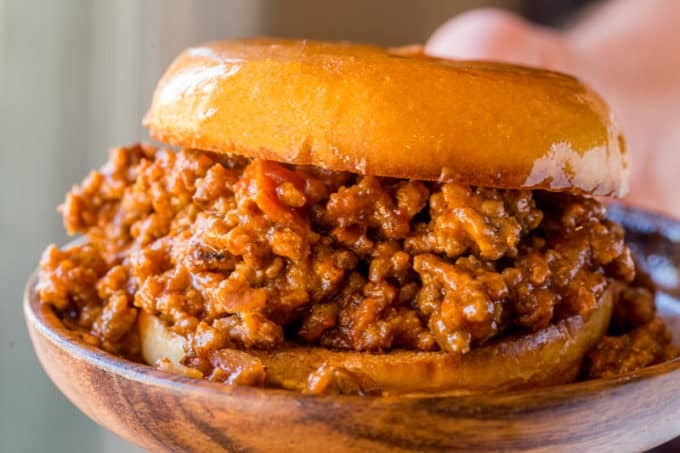 Homemade Sloppy Joes are all about comfort food flavors so we love serving them with Onion Rings, Potato Wedges, Sweet Potato Fries or Roasted Potatoes with them along with some healthier Roasted Vegetables. Make sure not to cook down the sauce too much, sometimes the sloppy joes can get dry, you’re looking for a consistency where you can see the individual bits of meat, but not dry enough where they don’t cling to each other in sauce. Make the sloppy joe recipe a little healthier by swapping ground beef for ground turkey. Sloppy Joes can be served again the next day if you add a bit of liquid to help create a bit more sloppy joe sauce. To avoid more sugar being added I’d start with some tomato sauce and water in 1/4 cup increments as you gently reheat and taste. To get a good sear on the meat use high heat instead of medium high, this will create a nice crust giving it a texture more like hamburgers. I personally add in some American or cheddar cheese to the filling when it is done. Some people like to top the sandwich with cheese. Either way cheese makes it just a little more awesome. If you hate green bell pepper feel free to swap it out for a less bitter bell pepper, like red pepper. You can also leave it out, but remember you are removing probably a half cup or more of ingredients, so it will be saucier. If you want a bit more savory flavor you can also add a tablespoon of Worcestershire sauce to the sloppy joe meat. If you would like to swap the ketchup for tomato sauce or tomato paste, just play with the rest of the ingredients to increase the sweetness more as the ketchup adds a definite sweet flavor. If you would like to use leftovers you may have in another recipe, just use the method found in my Ground Philly Cheesesteak Grilled Cheese and you’ll be in heaven! Add the ingredients (minus the cheese and buns) to the crock pot and cook on low for 4 hours. Stir before serving, scoop onto your hamburger bun and top with cheese. Brown the ground beef in the instant pot on the sauté setting per the instructions then add in the rest of the ingredients (except the cheese and buns). Add the lid and set the pressure to high for ten minutes. Release the pressure naturally for five minutes, open the top and either mix in the cheese or use it as a topping when scooped onto hamburger buns. Add the ground beef to a large skillet (this browns very well) on high heat and brown until a deep brown crust appears before breaking the beef apart. Stir the ground beef and brown until a deep crust appears on about 50 or so percent of the beef, and it is cooked through, then remove the beef, drain the fat and add the butter, onions and bell pepper to the pan. Let brown for 1-2 minutes before stirring, then let brown for another 1-2 minutes before stirring again and add the beef back into the pan. Add the garlic, mustard, ketchup, brown sugar, salt, black pepper, to the pan and cook until most of the liquid has evaporated (about 75% of the mixture is above liquid), 3-5 minutes. 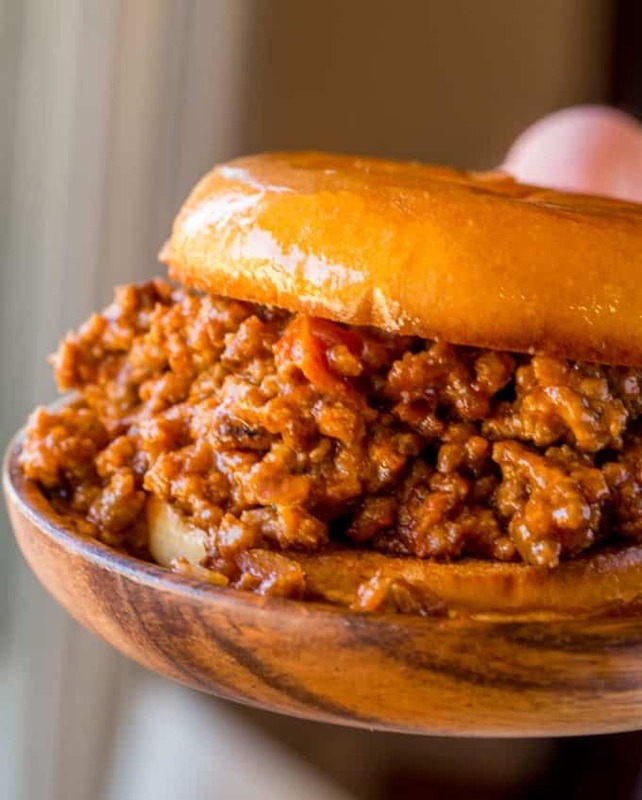 Served on hamburger buns with cheese or mix the cheese into the sloppy joe meat mixture. Just made this tonight. It was delicious. My sceptical husband asked for seconds. These were great! My 4 year old twins ate them even though “we don’t like onions”. Managed to sneak the green peppers right past them – suckers! Served mine with sharp cheddar cheese slice on Kings Hawaiian buns. Nice sweet kick to round it out. I made these! They are amazing! My Fiance’s mother uses this recipe too! I made this sloppy joe for supper tonight. I will be making again cause it was delicious. Thanks for sharing this recipe. We are making these for the second weekend in a row…they are awesome. Fantastic! So happy you love them so much! Interesting how only positive reviews are posted. This recipe was dreadful. For anyone who liked it; save yourself the work and simply pour some of your favorite bbq sauce into your hamburger. Much easier. However, probably won’t improve the outcome. I’m sorry this recipe didn’t live up to your expectation. I told my boyfriend I wanted to make sloppy joes for dinner… not from a packet but homemade and low in salt. He said “meh, okay” (disapproving but no other idea for dinner). I made these ultimate sloppy joes last night for dinner. I made the recipe as isand added some chopped jalapenos at the end. My boyfriend woofed them down and asked what was in these because they were the best sloppy joes he’s ever had. Thanks, Sabrina. Yay!! Thanks so much for coming back to let me know, Carol. This recipe was delicious! Ran out of ketchup. Used tomato sauce and half of the brown sugar. We couldn’t get enough. Awesome recipe I would totally recommend this to anyone!!! I just added some jalapeño peppers and Worcestershire and siracha and used half ketchup and half tomato sauce!!? So glad you enjoyed it, Rebecca! Great recipe for the Ultimate Sloppy Joes !!!!! These are awesome!!! I added some siracha and BBQ sauce and Worcestershire and jalapeño peppers to add a little spice ? Love this recipe. Huge hit with my wife. 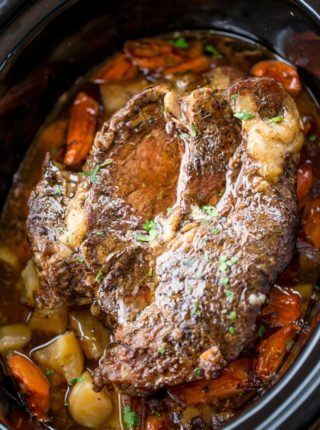 I want to make this in the slow cooker so I have a question about that. 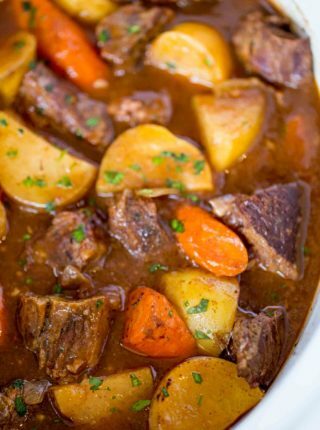 Do you brown the beef before adding it to the slow cooker or add beef uncooked? Why must every recipe on the Internet come with a long-winded tale? I don’t want to know your life story, foodies. I just want a damn recipe. Below the title of every recipe at the top of the page is a “jump to recipe” button. Click on that and it’ll take you right there. Without a doubt, BEST sloppy joe recipe EVER!!! This is my #1 go to sloppy jo that I go to every time! Never, ever will I buy that canned stuff again! Yay!! This just made me so happy!! Excellent. Will be making again! I Wanted to make Sloppy Joes this afternoon and needed the recipe for the sauce after scouring the pantree and finding no Manwich. Very Delicious! I will continue to make this insted of buying the can. Thank you! Yay so glad to hear it! 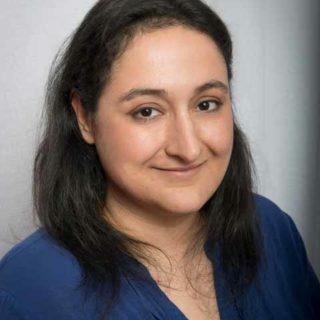 Thank you so much for coming back and leaving the review! I made these last night. I’d used 3 cloves of garlic to start with (we were in the mood for garlic), but I’m afraid we thought the final result tasted bland. I ended up adding extra salt, pepper, Worcestershire sauce, and then some vinegar from pickled banana peppers. They all helped a bit, but it just didn’t taste like Sloppy Jo sauces I’ve made over the years. I even accidentally used too much yellow mustard to start with, and was afraid it would taste too sharp, but it just tasted like something was missing. I feel badly that we didn’t like it – it was not terrible, by any means, it just didn’t taste like what we were expecting. Awesome sloppy joes! My son could not get enough. These sloppy joes are the best ever. I give them. 100 stars. I made this with bear meat, and opted out of peppers (ick!). But I added mushrooms and a couple splashes of Worcestershire sauce. Bear meat is really lean, so I didn’t have any grease to drain off. We didn’t have any cheese, so that was out, too. I served it on toasted sourdough hoagie rolls. This was shockingly easy to make, and actually took the amount of time listed to make, which never happens to me. Holy crow, they were delicious–my two-year-olds loved them! I am way less than stellar in the kitchen, so I’m counting the success of these “sloppy bears” as a major victory! I’m so glad you were able to customize them to your liking! Thanks so much for the 5 star rating! I like to add chopped celery to sloppy joes; in about half as much as the onions and/or peppers. I think it adds a depth to the mixture; maybe it’s just that my mom always did this and I liked hers a lot. Made these according to your directions, though, and they were very good. I have to make a bunch of these for an upcoming event, a big batch of beef sloppy joes, a fairly large batch of chicken or turkey sloppy joes, and a small lentil or jackfruit version. Will probably use your recipe for them, just varying the protein. May or may not add the celery this time, but thanks for a great recipe. Just made this, so tasty! Just exactly like sloppy joes are supposed to be. I always wing it and sometimes it wouldn’t come out right, then I saw this recipe and the ingredients were very close to mine so now I have the correct measurements so they’ll come out great every time! Yep. This recipe is written with great care, which always draws our attention. We thought 2 Tsp was a lot of sugar, so we used 2 tsp instead, and we melted 1 anchovie with the onions like one would for a ragu.